Here are a few useful probabilities for American roulette. Alongside the charts, I've included graphs that compare the American roulette probabilities to those of the European roulette probabilities. The difference in odds and probability for these two variants is explained at the bottom of the page. American roulette bets probability chart. A simple bar chart to highlight the percentage probabilities of winning with the different bet types in American and European roulette. When playing on an American roulette wheel, what's the probability of seeing the same colour appear X times in a row? The table below lists both the ratio and percentage probability over successive numbers of spins. Example: The probability of the same colour showing up 6 times in a row on an American roulette wheel is 1.13%. 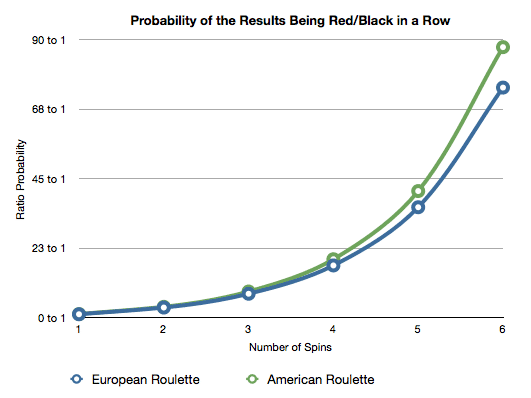 A graph to show the probability of seeing the same colour of red/black on an American roulette table (compared to the odds on a European table). The probability of seeing the same colour appear on successive spins just over halves from one spin to the next. You'll also notice that it's less likely to see the same colour appear on multiple spins in a row on an American roulette wheel than it is on a European wheel. This is not because the American wheel is "fairer" and dishes out red/black colours more evenly -- it's because there is an additional green number (the double zero - 00) that increases the likelihood of disrupting the flow of successive same-colour spins. Why are the probabilities in European and American roulette different? 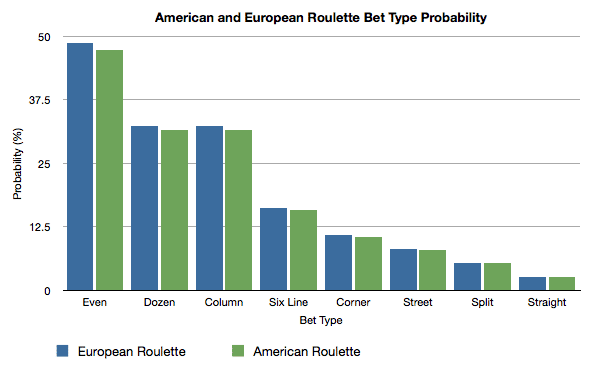 The probabilities in American and European roulette are different because American roulette has an extra green number (the double zero - 00), whereas European roulette does not. Therefore, the presence of this additional green number ever so slightly decreases the probability of hitting other specific numbers or sets of numbers, whether it be over one spin or over multiple spins. For example, if I had a bag with 1 red, 1 black and 1 green ball in it and asked you to pick out a ball at random, the probability of choosing a red ball would be 1 in 3. Now, if I added another green ball so that there are now 2 green balls in the bag, the probability of picking out a red ball has dropped from 1 in 3 to 1 in 4. This exact same idea applies to all the probabilities in American roulette thanks to that extra 00 green number, just on a slightly bigger scale. Fact: This difference in the probabilities also has a knock-on effect for the house edge too, which is because the payouts in both variants remain the same. You can find out more about the differences between these two games in my article on American vs European roulette.